The final trailer of Disney's remake of The Lone Ranger may as well haul the cash in. Said trailer focuses on the epic story set during the Railroad Era and the grand battles that ensued between the American Natives and the "white men" (I am no expert on American history, ok?). This time around the trailer gives a little more background on the titular character, The Lone Ranger, played by Armie Hammer. The quadro team-up of Disney, Jerry Bruckheimer, Gore Verbinski and Johnny Depp, and more that made Pirates of the Caribbean a success is united once again to dish out another future blockbuster hit. You well may watch the trailer below and enjoy Tonto's seriously comedic antics that only Johnny Depp could arguably pull off. Also, a French trailer has showed up online, giving more emphasis on the said Railroad Era and the comedy as well. From producer Jerry Bruckheimer and director Gore Verbinski, the filmmaking team behind the blockbuster "Pirates of the Caribbean" franchise, comes Disney/Jerry Bruckheimer Films' "The Lone Ranger," a thrilling adventure infused with action and humor, in which the famed masked hero is brought to life through new eyes. Native American spirit warrior Tonto (Johnny Depp) recounts the untold tales that transformed John Reid (Armie Hammer), a man of the law, into a legend of justice--taking the audience on a runaway train of epic surprises and humorous friction as the two unlikely heroes must learn to work together and fight against greed and corruption. 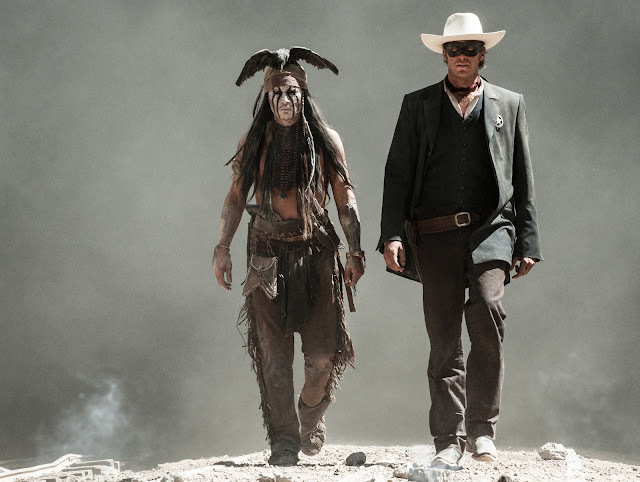 The Lone Ranger will be reborn on July 3, 2013.